In today's afternoon session, we enjoyed a thriller between an AIBA Pro Boxing (APB) boxer and a former World Series of Boxing (WSB) boxer in a display of extraordinary class at the AIBA World Boxing Championships Almaty 2013. It was the turn of the Bantamweights (56kg) and Middleweights (75kg) to demonstrate their athletic prowess today, and they certainly didn't disappoint with some wonderful boxing on display. Let's take a closer look at what happened. England's former British Lionhearts team member Gamal Yafai took to the canvas against APB Bantamweight Aram Avagyan of Armenia in the clash of the session. 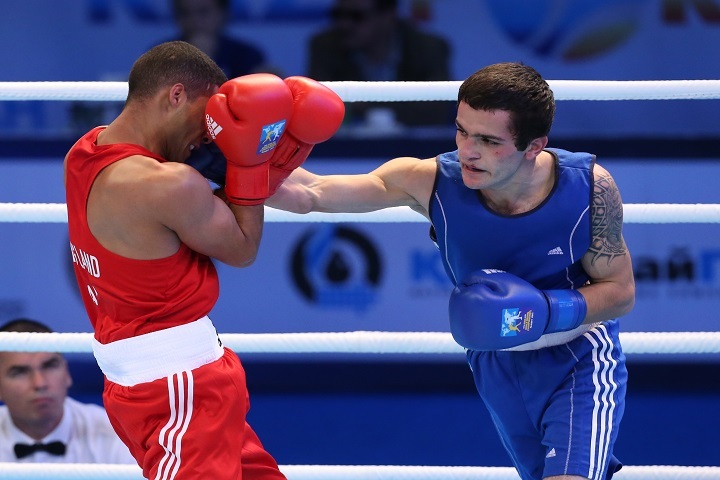 Yafai's brother Khalid previously fought well in the Baku World Championships in 2011 and narrowly missed out on an Olympic spot following a box-off with Welshman Andrew Selby (who boxes here tomorrow). Encapsulating everything you would expect from two such world class competitors, the technical level displayed was superb. The darkest recesses of each boxers bag of tricks was mined in a desperate effort to find that little "something extra" that they needed to gain an edge. The bout was so tight that it was awarded 29:28 by all three judges. Finally it was the Armenian APB boxer who got the green light to advance to the next round after winning one of the best bouts we have witnessed so far in this tournament. Jiawei Zhang of China fought Edgar Walth of Germany in his opening bout at Bantamweight. The high energy Chinese competitor was clearly the superior boxer from the opening bell. Fortunately the German had a good defence because it was severely put to the test. Zhang seemed to operate on the principle that relentless attack was the best option and although his shots were not the most powerful, they just did not stop coming for the whole bout. For instance, Walth only had the space to get off a dozen or so punches in the whole of round two. The German lad did his best but was up against one of this year's most serious medal contenders in Zhang, who took a comfortable win (3:0). Dolce & Gabbana Italia Thunder's Bantamweight Jahyn Parrinello faced Georgia's Avtandil Chubabria in a very open bout in which more emphasis was placed on striking the opponent than covering up or avoiding blows. Initially you got the feeling that something could happen at any time. Instead, the bout became a messy and scrappy affair. The Italian seemed the fitter however, and the difference became apparent in the last minute of the final round where the Georgian seemed to back down significantly, leaving Parrinello to win by split decision 2:0. Nepalese boxer Dinesh Shrestha was willing to mix it up quite well against Uzbekistan's Shakhriyor Isakov at Bantamweight, but wasn't getting the best of the exchanges until he caught his opponent with a hard cross and forced a standing eight count in the second round. Three successive slips to the floor removed any advantage this may have gained for the man from Nepal, and the Uzbek was back in the driving seat. With 40 seconds left in the round, Shrestha was also given an eight count. The Uzbek boxer took the win 3:0 but Shrestha put up a good show. Yoni Pacheco of Venezuela seriously impressed with his surprise win over WSB British Lionhearts veteran Sean McGoldrick of Wales at Bantamweight. The Venezuelan looked very mobile and whilst the WSB boxer was punching well, he couldn't seem to get his legs going. The classy 22 year old Pacheco deservedly caused an upset with what was in the end a comfortable looking win against extremely tough opposition. Middleweight Jaemin Jeong from Korea also looks like he is worth keeping an eye on. He is in an incredible shape and looked awesome against Arman Hovhikyan of Armenia, who was clearly handy enough. The Korean is definitely worth following after his split decision win 2:1.